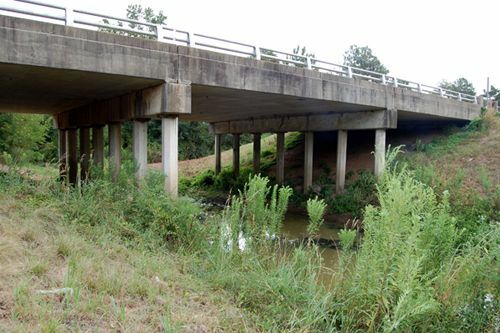 In the area of Fouke, Arkansas in Miller County, southeast of Texarkana, allegedly lives the Boggy Creek Monster. In these sparsely populated, forested hills of the Ozarks, the Boggy Creek Monster, also referred to as the Fouke Monster, has been a legend of the area since the 1840’s. This Bigfoot-like creature is said to be about seven feet tall, walks upright, has a smelly, animal like odor, and is covered with hair. The Arkansas version of Sasquatch or Bigfoot, this hairy beast has a reputation for killing chickens, livestock, and dogs in the area, though has never been known to harm humans. In the late 1860’s the beast allegedly harassed two families living outside Fouke and the legend quickly spread. 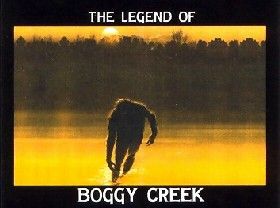 In 1973, the tale of the Boggy Creek Monster was made into an extremely poor low budget movie called The Legend of Boggy Creek. In 1997, there were more than 40 sightings of the Boggy Creek creature and in 1998, reports said that the hairy beast was seen walking along a dry creek bed about 5 miles south of town. 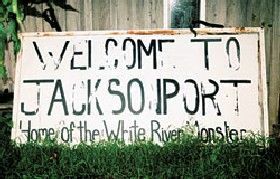 Whether a legend or reality, the town of of Fouke once capitalized on the legend, with signs throughout the town and a gift shop near Boggy Creek that provided Monster souvenirs. This is not the case anymore. Perhaps the locals have grown tired of the tale and the “looky-lous” frequenting the area and their many questions. We really had to search for the creek, which we finally found south of town, marked only by a small plaque on the bridge. The Fouke Monster was allegedly last seen near the junction of the Sulphur and Red Rivers. Not only is Hope, Arkansas the birthplace of that “quirky” ex-president Clinton, it also has lots of other seeds to spit out of its mouth, including the world’s largest watermelon festival and a replica of the world’s largest watermelon. They used to even have a watermelon water tower, but it’s now painted white, some say to give the town a more “respectable” look in honor of Clinton. Darn!!! That would have been a great photo opportunity! 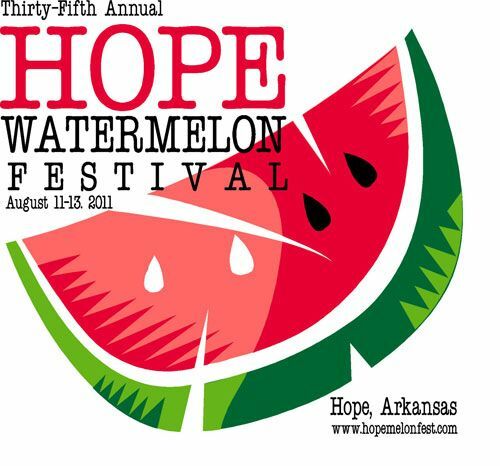 In any event, watermelons have long been a calling card for the City of Hope with its watermelon festival dating back to the 1920’s and continuing to draw as many as 50,000 people during its four day August event, to spit, dribble, crunch and slice their way through a whole bunch of the fabulous fruit. The festival features not only lots of watermelon for your eating pleasure, but arts and crafts booths, more food — including burgers, pork rinds fried catfish, and chicken-on-a- stick, to a wide variety musical talent. But the best part of the festival is the Watermelon Olympics where local teams are pitted against each other in such events as a seed-spitting contest, watermelon-eating contest, watermelon auction, and a contest to see who can grow the biggest, some easily tipping the scales at more than 200 pounds. Located in the southwest corner of the state, Hope is 25 miles northeast of Texarkana. “Whitey” as the locals call him, has been sighted frolicking in the White River for more than a century and a half. The creature was first spied by the Quapaw Indians who once inhabited the area and the tale was passed down from generation to generation. According to this first account, the creature overturned a brave’s canoe before sinking back into the depths of the river. During the days of the Civil War, Whitey was accredited for overturning a loaded Confederate gunship. The White River Monster is described as snake-like, about thirty feet long with a spiny backbone, and makes a loud bellowing noise. Most of the many reports came from fisherman and campers along the White River. In 1924, a Little Rock resident reported having seen the creature, further describing it as having a dingy gray, crusted hide. In 1937, a farmer named Bramleltte Bateman who lived south of Newport proclaimed to have seen the animal several times, saying: “The animal rises to the surface in the late afternoons and floats or swims around 5 to 15 minutes with its head underwater.” Intending on capitalizing on the sensation, Bateman soon set up a viewing area where he charged a 25¢ for a chance to see the monster, and also sold sandwiches and soft drinks. Though business was brisk for a short time, no one else ever saw the creature. In 1966, three people fishing also saw Whitey, describing it as having a tail like a mermaid’s, a long body, arm-like flippers and a head shaped like a monkey’s. In 1971, two men reported that they saw three-toed tracks along the muddy river banks, as well as in the trees near the river. This same year, the monster was photographed by a man by the name of Cloyce Warren of the White River Lumber Company. Several other people that same year also claimed to have seen the sea monster. These multiple accounts were enough to convince the Arkansas State Legislature, who created the refuge two years later. Though the furor persisted, at least one biologists believed that the White River Monster was actually a lost elephant seal who had somehow migrated out of its normal ocean habitat up the Mississippi River and into the White River near Newport. In the last several years the “sea monster” hasn’t been spied but most of the locals believe that it is still there. Others think that the creature died when the river became too shallow. In the meantime, Whitey has become Newport’s local celebrity as his facsimile leads the Christmas Parade every year and the legend has created a hubbub of souvenir shops, signs, and other promotions in Newport. 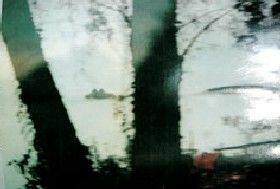 White River’s version of the Lock Ness monster has also been documented in newspapers and books around the world as well as in several television documentaries. Newport, Arkansas is located about ninety miles northeast of Little Rock on Highway 67. Alma is the self-proclaimed Spinach Capital of the World and commemorates this by painting its water tower to be the “world’s biggest can of spinach.” This company town for Popeye Brand Spinach, also celebrates its heritage with an annual Spinach Festival each April that includes arts and crafts, food vendors, a car show, entertainment and an Spinach Festival Talent Show. 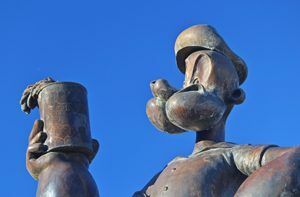 Continuing with the theme, an eight foot statue of Popeye sits in front of City Hall, but evidently not everyone on Alma is a hero like Popeye, cuz’ the larger than life sailor man was stolen here a few years back. But, alas, the spinach obsessed character was found dumpster-diving at Walmart just a few days later and has since returned to his perch. If spinach is your bag (or can, should we say,) Alma also offers outdoor enthusiasts, opportunities to hike, bike, fish, camp, hunt and canoe at nearby White Rock Mountain Recreation Area, Lake Fort Smith State Park and Ozark Highlands Trail. The town is located on two major interstates, I-40 and I-540, and U.S. 71, which is part of the Boston Mountain Scenic Loop. Alma is located in the Arkansas River Valley about 15 miles from Fort Smith and at the foothills of the Ozark Mountains and Fayetteville, which is about 45 miles away.